Authentic Hawaiian Shave Ice Desserts, just like the one's you get on the North Shore of Oahu! Almost 30 different flavors to choose from, and some of the most unique fillings & toppings to boot! Pick one of our amazing flavor combos or create your own! Our snow is light and fluffy; this isn't the typical "snow-cone". Our "Honu-Hut" will arrive ready to serve you and your guests at your next special event. 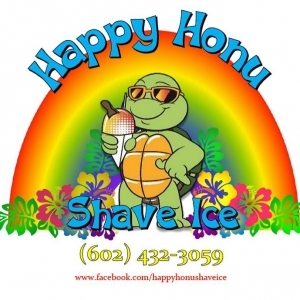 Here at Happy Honu Shave Ice, we don't just make shave ice, we design smiles!